You are at:Home»Lex Pedia»Lex Articles»Formation of States in India: A Historical Approach. In the recent days, with the announcement of creation of “Telangana” as the 29th state of India, there has been a lot discussion over the pros and cons of smaller states in comparison with larger states. Similarly there has been a demand for creation of new states from many corners of India. Before going into the topic of “contention”, it would be appropriate to first discuss the historical background of the “Provincial Setup” of the Indian “Federation”. 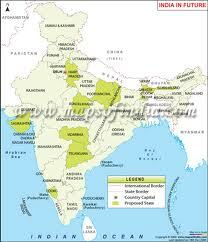 During the reign of the Britishers, India was divided into near about some 600 princely states and provinces. When India got Independence by the Indian Independence Act, 1947, these states were given the option of either joining India or Pakistan. Depending on their geographical and also on “religional” orientation some states went with India and some with Pakistan. Hyderabad, which was at that time one most the most prosperous province, chose to be independent but India using its military power annexed Hyderabad and thus Hyderabad also became the part of the Indian Federation. Between 1947 and 1950 these provinces were legally changed into “States” but the States of Mysore, Hyderabad, Bhopal and Bilaspur were given the special status of “Independent” States. With the Commencement of The Constitution of India from 26th January 1950, India became a Union of States and Union territories. At that time, the Constitution of India recognized three types of States, which were; first; “Part A” States, these states were those states which had a Governor as their executive head before Independence i.e. during the British reign, these type of states included states like Bombay, Madras, and U.P. etc. The second category of states were known as “Part B” States, these were the states which were previously known as the Princely Provinces, these type of states included Hyderabad, Mysore and Rajasthan etc. And the last category was of the “Part C” states comprising a mixture of states which in the past had either been a Princely State or a state being governed by a Chief Commissioner. In the 1950’s there was urging demand in the people, especially in the Telugu speaking population, for reorganisation of states on lingual lines. One Potty Shreeramalu started indefinite fast for supporting his cause of states reorganisation. On the 56th day of his fast he died. His death resulted in widespread violence and the government was forced to constitute a State Reorganisation Commission. On the basis of the Report of this Commission, The State Reorganisation Act 1956 was passed and accordingly Andhra Pradesh became the First state to be created on lingual lines. The same Act also brought to an end the differences between the Part A, B and C states and created 14 states and some union territories, in 1960 states of Maharashtra and Gujarat were created by the division of the State of Bombay. In 1966, the State of Punjab was divided and two new states saw the light of day which were Haryana and Himachal Pradesh. In the year 1972 Meghalaya, Manipur and Tripura were given the status of “States”. In the year 1987, three new states were added to the list, they were Mizoram, Goa and Arunachal Pradesh. The latest in this addition till date is the creation of Uttrakhand, Chhattisgarh and Jharkhand in the year 2000 which took the state tally to 28. The Right path in this regard is that again The State reorganisation Commission should be constituted and new states should be created not on political lines or for political gains or loss but for the development of that concerned region and the populace of that place.